Katie Ledecky is a young talented and most decorated freestyle swimmer of America who has several credits to her name, including five-time Olympic gold medalist and 14-time world champion. She holds several records in freestyle events and has received various awards during her career like the Swimming World’s World Swimmer of the Year, Associated Press Female Athlete of the Year Award in 2017, and United States Olympic Committee Female Athlete of the Year. Katie Ledecky was born on the 17th of March 1997, in Washington, D.C., United States of America. She’s currently 22 years old. Katie attended Little Flower School and graduated from Stone Ridge School of the Sacred Heart in 2015. She then enrolled with an athletic scholarship at the Stanford University. Katie has kept her personal life discreet from her professional life and thus we are uncertain about her love life and past relationships. Katie Ledecky was the youngest American when she made her international debut at the 2012 Summer Olympics in London, in which she won the Gold third in the 800-meter freestyle event. She received the 2012 Best Female Performance of the Year and Breakout Performer of the Year at the Golden Goggle Awards. At the 2013 World Championships, Ledecky won gold in the 400-, 800-, and 1500-meter freestyle, and in the 4×200-meter freestyle relay, and set two world records. She was only 16 when she achieved her first world record in 1500-meter freestyle relay at the 2013 World Championships, Barcelona, Spain. She won gold in the event in a world record time of 15:36.53, breaking the record held by compatriot Kate Ziegler by six seconds. In 800-meter freestyle, Ledecky won gold in a world record of 8:13.86, at the 2013 World Championships, Barcelona, Spain on August 3, 2013. At the 2014 Woodlands Swim Team Senior Invitational, Ledecky set two records in the 1500-meter freestyle and the 800-meter freestyle, finishing in a record time of 15:34.23 and 8:11.00, at the age of 17. At the 2014 Pan Pacific Swimming Championships in Gold Coast, Australia, Ledecky broke two world records in the 1500-meter freestyle and the 400-meter freestyle, with times of 3:58.37 and 15:28.36, respectively. She won five gold medals through the tournament becoming the first woman to win four individual gold medals at a single Pan Pacific Championship. At the 2015 World Aquatics Championships in Kazan, Russia, Ledecky broke three world records in the 800- and 1500-meter freestyles, with times of 8:07.39, 15:27.71 (1500 m) and 15:25.48 (1500 m), respectively. At the 2016 Summer Olympics in Rio de Janeiro, Brazil, Ledecky broke two world records in the 400- and 800-meter freestyles, with times of 3:56.46 and 8:04.79, respectively. Katie made her debut appearance on television on Fox News Sunday in 2014. Katie has appeared in a TV advertisement for Pool Safely. 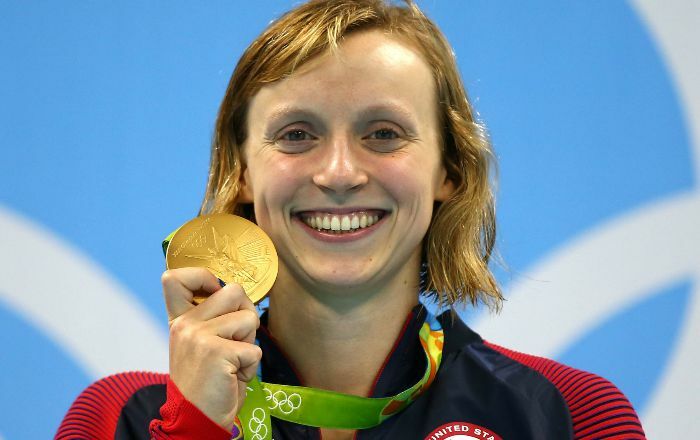 Katie Ledecky has a net worth of $3.5 million and all of the money coming from her swimming career. Katie has been swimming since she was six years old. She represents Team USA in international championships and holds 14 individual titles at the Olympics (four) and World Aquatics Championships (10). She has broken thirteen world records in a career spanning over five years at international arena. She holds several records in the women’s 400-, 800-, and 1500-metre freestyle events as well as holds the fastest-ever times in the women’s 500-, 1000-, and 1650-yard freestyle events. Ledecky is involved with multiple charities, including Catholic Charities, Shepherd’s Table, Bikes for the World, and Wounded Warriors. She was awarded with the Swimming World World Swimmer of the Year Award from 2013 to 2016 and Swimming World American Swimmer of the Year Award from 2013 to 2017. Katie was honored with the Women’s Sports Foundation Athlete of the Year (Individual Sport) in 2017. She has received many Golden Goggle Awards in various categories including Female Athlete of the Year Award (2013 – 2017), Female Racer of the Year Award (2012 – 2015) and Breakout Performer Award in 2012. Besides breaking her own records, Ledecky has broken several records set by other international swimmers in international tournaments.